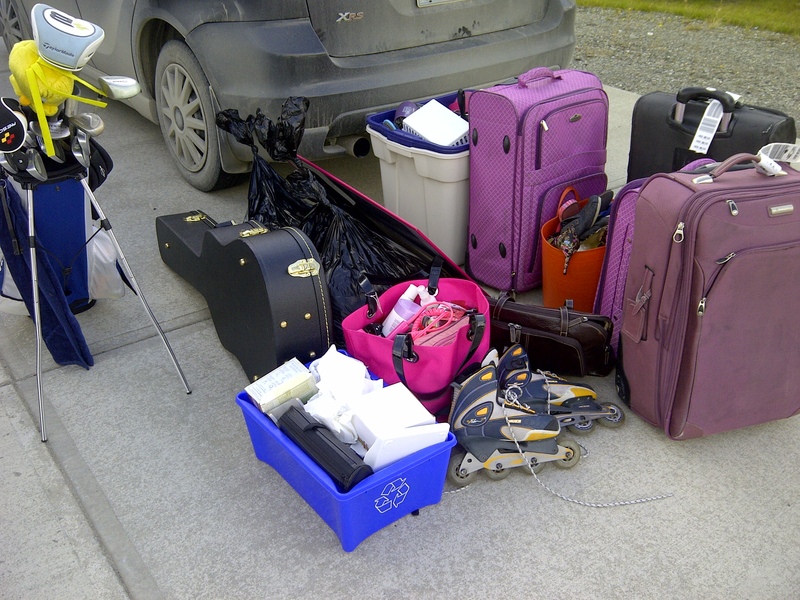 Road trip time – and the Alaska Highway it is! I have to say, all the time I spent rolling t-shirts for t-shirt tosses while working for the Oilers/Oil Kings paid off this week while packing. My brother ended up leaving at the same time as me to bring my dog, Jovo, down to Kelowna, so we have been able to convoy along the route so far. Tomorrow we’ll have to head in different directions, but it was nice to be able to travel together today. There is something really intimidating about being in literally the middle of nowhere, miles from the nearest town and hours away from cell service. I definitely use the term “town” loosely here, as many of the little stops along the highway either consist of only a gas station or have become ghost towns completely. Anyways, we started the day with an easy drive on the Yukon side of things. 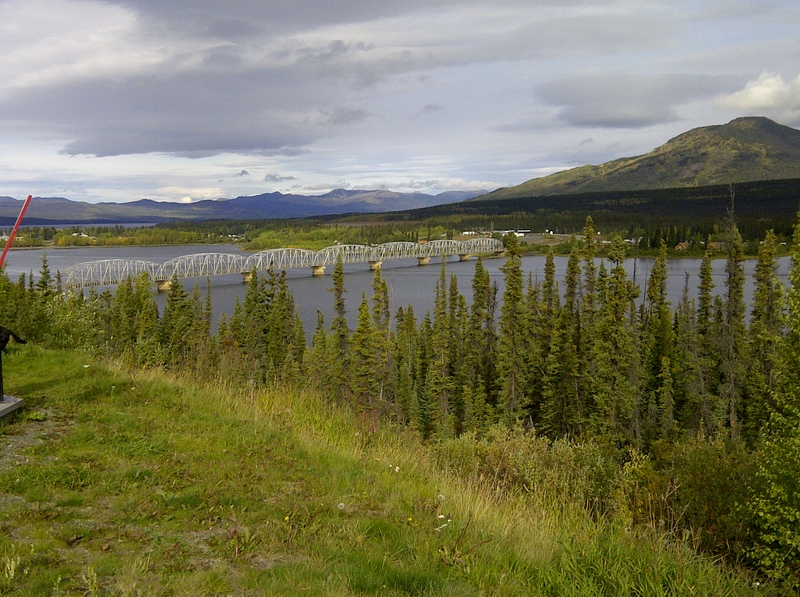 We stopped at Teslin to let Jovo run around, and this was the view we had from our perch. 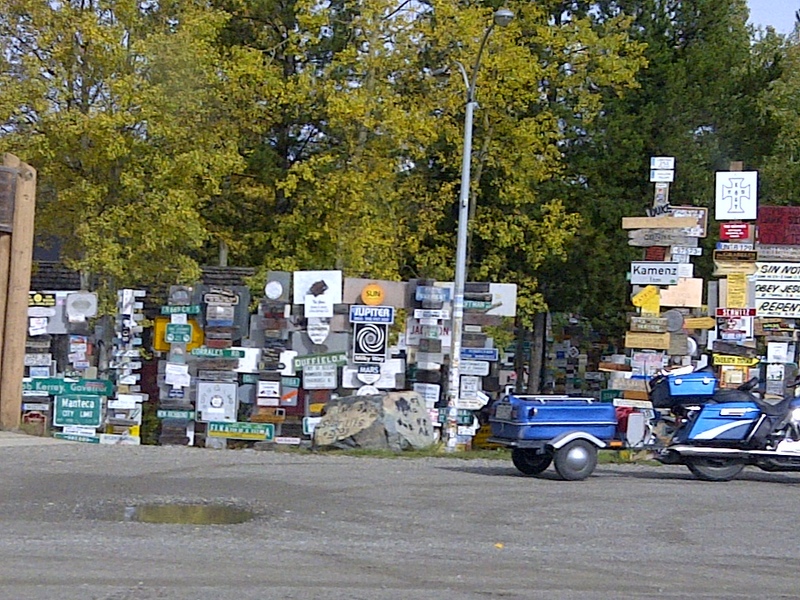 We made another stop in Watson Lake a few hours later, and I snapped a photo of the very touristy signpost forest. Basically, people from all over the world hang signs from their home town/city/country on these posts. I guess it kind of promotes vandalism and theft of public property (the signs), but people seem to like stopping here… it gets visits from all over the world. 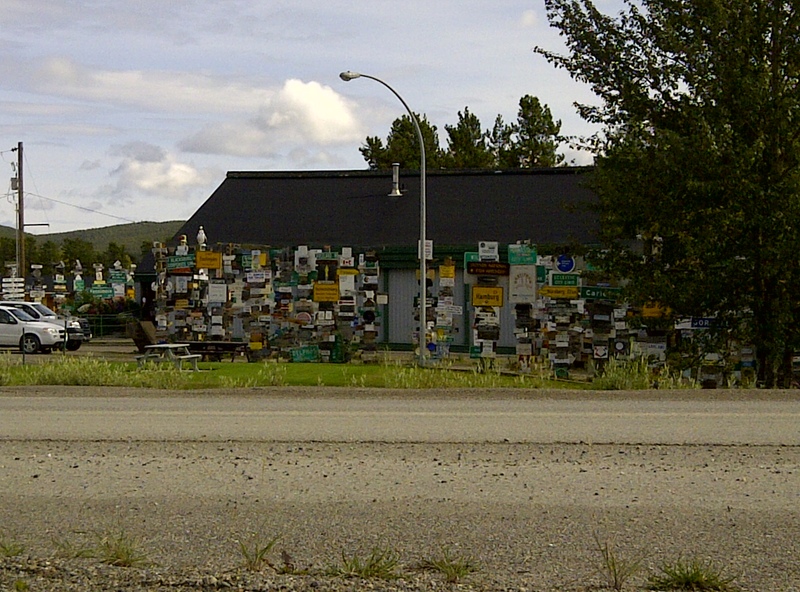 Between Watson Lake and Fort Nelson is one of the most beautiful sections of the drive… but also the most intimidating. The Stone Mountain and Muncho Lake Provincial Parks are absolutely gorgeous, but the roads twist and turn through mountains, along cliffs, and around the edges of deep mountain lakes. Every time I drive this route, I wish that I had taken pictures during this section of the drive, but it is also the part that requires the most concentration… not to mention, much of this segment has cliffs rising up to one side, and stopping is not allowed. I was even more mesmerized than usual throughout most of the day as I have never driven this highway so late in the year before, and the abundance of red, orange, and yellow leaves made everything look very different. I did add something today to my list of things to do before I die. This list has yet to actually be created, so I guess today I decided on the first item on the list. Somewhere along this aforementioned part of the Alaska Highway, there was an adorable little sign pointing to “Strawberry Flats Campground”. This campground is on the edge of a beautiful lake, and looks to be the tiniest campground I have ever seen. I’ve driven by this area before and the sign has always caught my eye – I have now decided I would one day like to camp there. I find, being a northern local, I tend to just power through this route every time I do it, as opposed to the tourists that do this adventure the right way. In fact, maybe I should just look at doing this trip in several days instead of just two, and stopping at every sight along the way. As much as I love the Alaska Highway now, I think I would appreciate it even more after experiencing it like that. Jovo, frolicking in the bushes during one of our stops. Pretty cute, isn’t he? Welcome to my blog… this is something new to me, so I’m sure I’ll learn how things work as I go along. I finished my last day of work on Wednesday, and am getting ready to road trip down to Edmonton and Kelowna with an eventual flight to Hawai’i to spend a couple months there. 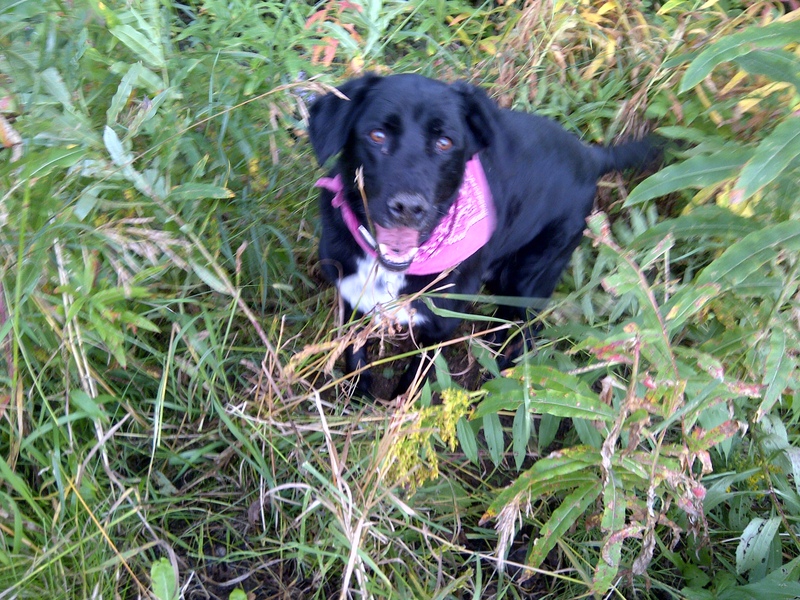 I figured this was probably a decent time to start a blog so that I can keep everyone updated with what I am doing. Plus, I have been so inspired by Kristin & Justine’s blog about their Europe travels, viewable at http://www.wonderandwanderlust.wordpress.com. Basically the next few weeks will be full of driving, visiting with friends, and hopefully golf. The end of September will be spent touring the sights of Los Angeles and San Francisco, and the beginning of October will finally see me on the Big Island of Hawai’i! I am very excited about this adventure, and really have no idea what to expect. I will be living with my Aunt and Uncle in Waikoloa, and getting to know my young cousins. I hope to spend lots of time lounging in the heat, as well as taking in all the touristy sights I can.